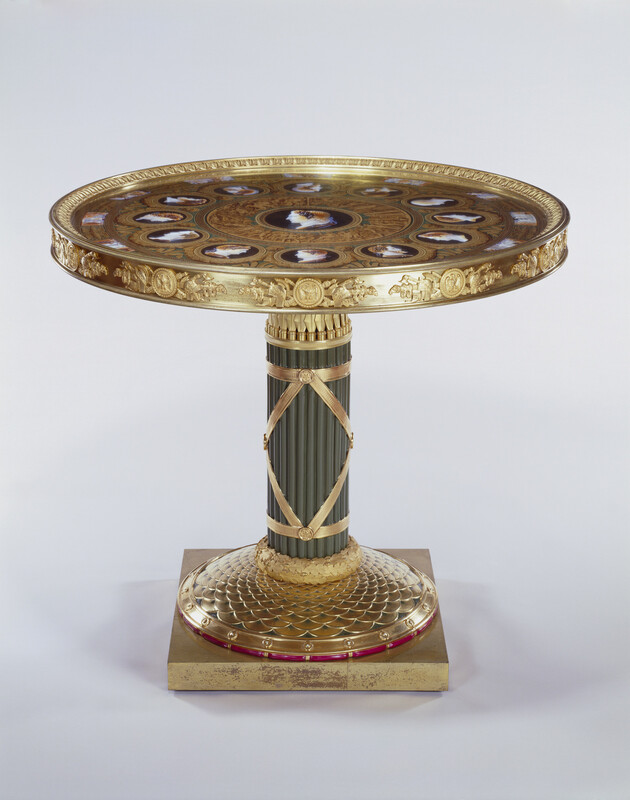 Centre table with circular Sèvres porcelain top with chased gilt bronze mounts, stem-fasces; painted in imitation of classical cameos. 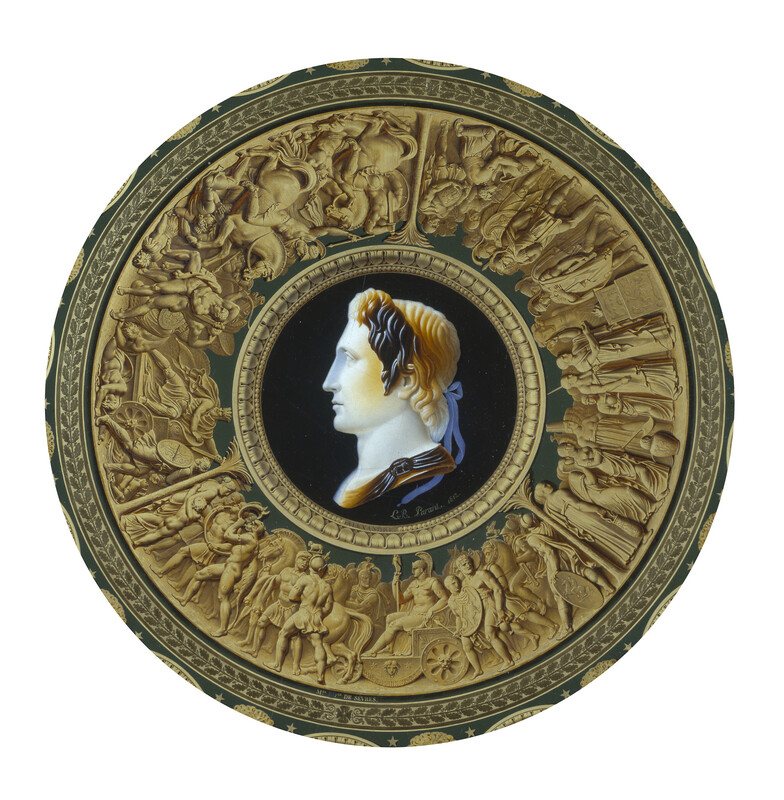 In the centre is the head of Alexander the Great, surrounded by an outer circle of heads of twelve commanders from Antiquity, above scenes of notable events to each. Known as the Table des Grands Capitaines de l'Antiquité, the table was commissioned by Napoleon in 1806 and was originally intended to form part of a set of four grand presentation tables designed to immortalise his reign. Made almost entirely of hard-paste Sèvres porcelain, it took six years to complete and combines some of the finest and most technically challenging work achieved by the factory in the early nineteenth century. An internal wooden structure supports the revolving top. 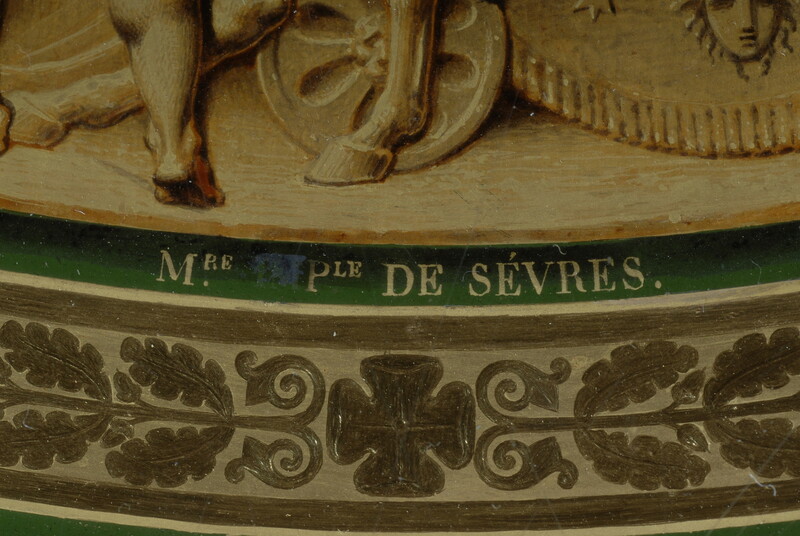 The delicately painted porcelain sections were decorated by the Sèvres artists Louis-Bertin Parant (active 1806-41) and Antoine Béranger (active 1808-48), and the finely chased gilt bronze mounts were supplied by Pierre-Philippe Thomire. The total cost amounted to 29,025 francs. 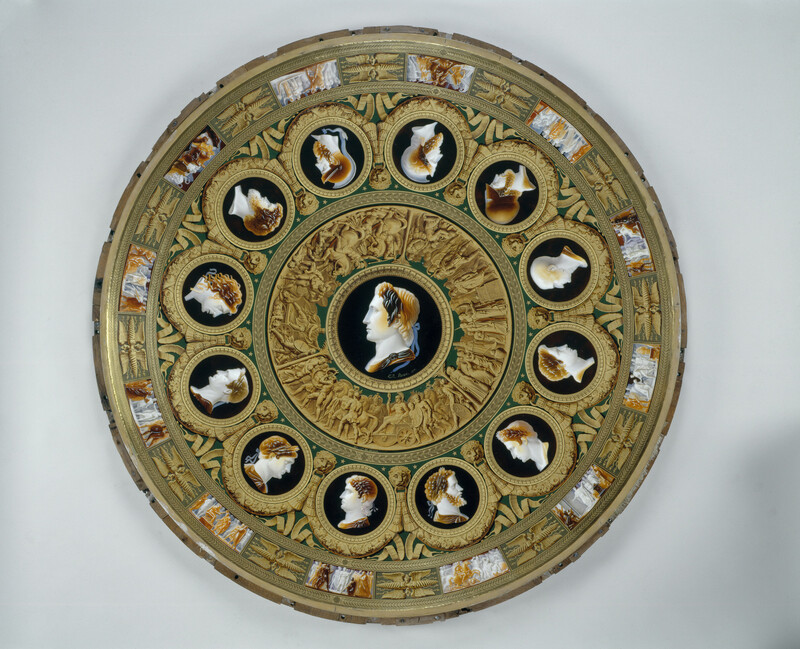 The most striking and original feature of the table is the elaborately decorated top, painted in imitation of sardonyx, with heads and scenes resembling cameos. 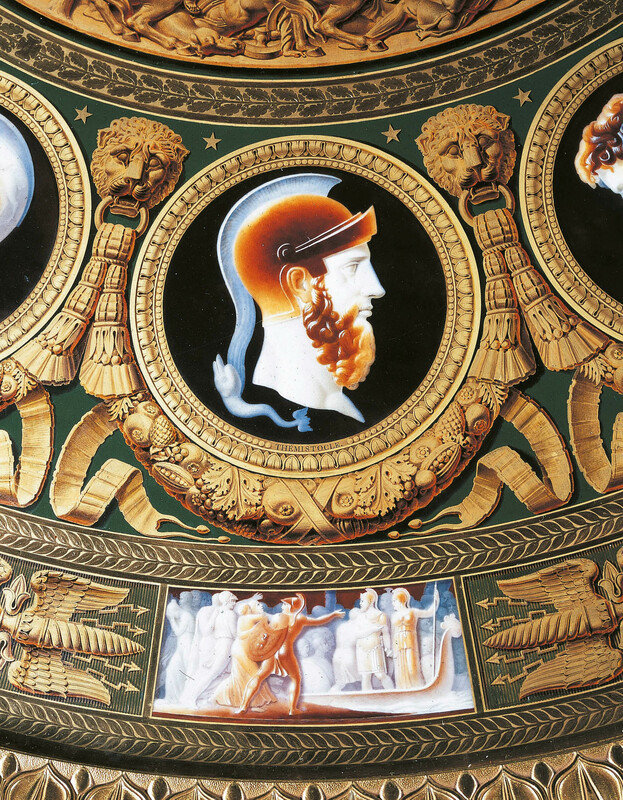 In the centre, the profile head of Alexander the Great is surrounded by 12 smaller heads of other commanders and philosophers from antiquity and scenes recalling notable events of their lives. Starting from the top right of the table, the depicted figures are: Pericles, Scipio Africanus, Pompey, Augustus, Septimus Severus, Constantine, Trajan, Caesar, Mithridates, Hannibal, Themistocles and Militiades. 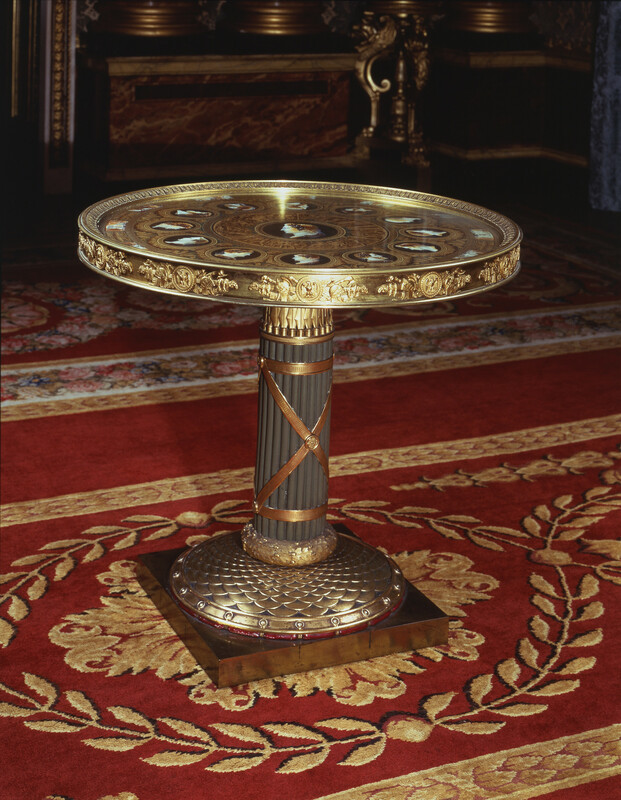 The table was the most prestigious and conspicuous present given to George IV by a grateful Louis XVIII, two years after the defeat of Napoleon. So highly did George IV regard this gift, and such was its status in his eyes, that it became part of the ceremonial backdrop for all his state portraits. According to Pyne, writing in 1819, it was placed in the bow of the Rose Satin Drawing Room, Principal Floor, Carlton House. It was later recorded in the Bow Room, Basement Floor of Carlton House. Signed and dated in white on black in the centre of the plaque under the head of Alexander the Great: L.B. 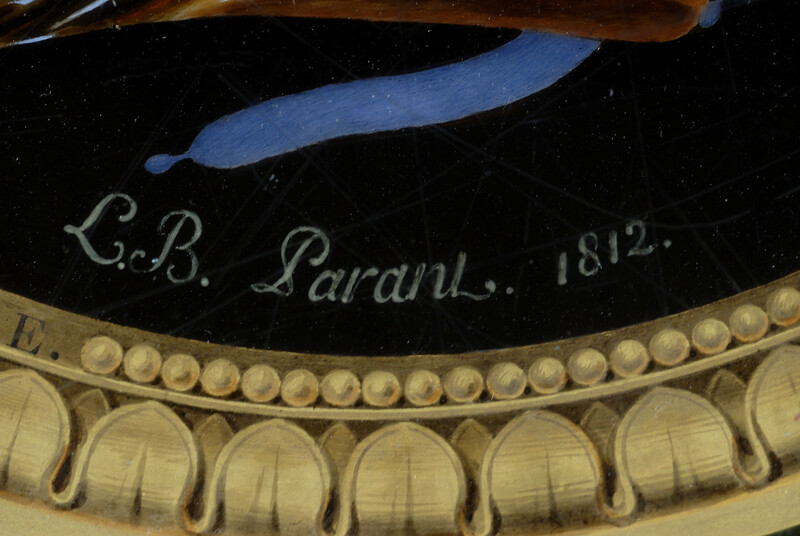 Parant 1812 (Louis-Bertin Parant, figure painter). The table was delivered to Carlton House on 3 May 1817. Benjamin Jutsham’s laconic entry in the receipts’ ledger reads: ‘[Received from] Custom House Two Cases, Said to Contain a Beautiful Table from The King of France. May 3d 1817 sent to Carlton House by the French Ambassador under the Care of Mr Alexr Robinson, Dock Agent Custom House …’. Pierre-Philippe Thomire was the outstanding Parisian bronzeur and gilder of the early nineteenth century. 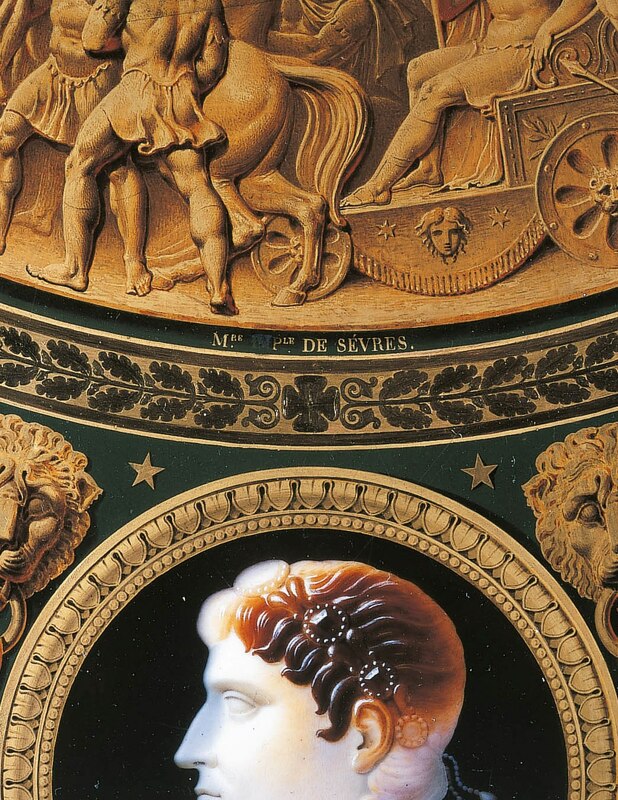 He supplied finely chased mounts to leading Parisien ébénistes for furniture, clocks and the Sèvres porcelain factory. He was much patronised by Napoleon who made him Ciseleur de l'Empereur. His work represents some of the finest examples of Empire style. In 1804 he acquired business of the marchand-mercier, Martin-Eloi Lignereux. 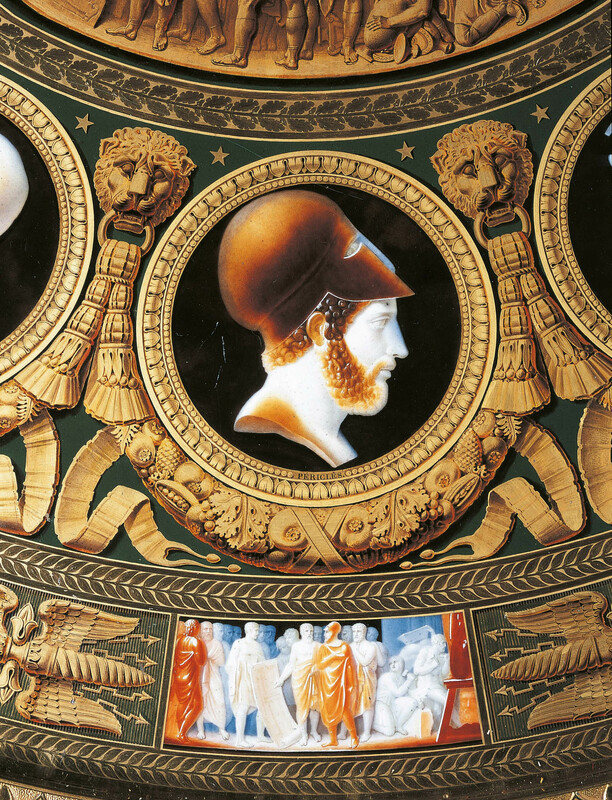 The company employed a large workforce in a workshop at rue Boucherat and a showroom at rue Taitbout, from where Thomire retailed a large range of decorative objects inspired by antiquity including candelabra, extravagant centrepieces, clock cases and monumental Greek and Roman style urns and vases. Thomire collaborated with three partners, renaming the business for a time Thomire, Duterme et Cie. The business suffered as a result of France's continuing European hostilities and to avoid bankruptcy the firm was granted dispensation to trade with the Prince Regent . Soon after 1815 the partnership with Duterme was dissolved and, under the old style, Thomire et Cie thrived once more under the restored Bourbons. Thomire retired in 1823 and his two sons-in-law, Louis-Auguste-Cesar Carbonelle and André-Antoine Beauvisage, continued the business until 1852. Thomire continued to work as a sculptor and exhibited regularly at the Salon until 1834.